This piece about being a hospital kid, especially one with CRPS/RSD, was originally posted on The Mighty. When you’re a spoonie you spend a lot of time in the hospital. About 10 years ago, I spent more than 10 cumulative weeks of my freshman year of high school either in the hospital or at doctors’ appointments. During my middle and high school years, my experiences with reflex sympathetic dystrophy syndrome (or CRPS) landed me two six-week stays at Children’s Hospital of Philadelphia, two 10-day stays at Boston Children’s Hospital, and more doctors’ appointments than I can realistically count. When I was in high school, most of my inside jokes were with physicians who liked to dance every morning. I got excited about making toga costumes with hospital sheets and having photo shoots with the other girls in the clinic. My main priority, aside from going home, was befriending the nurses so they would steal pillow cases for us to tie dye or extra ice cream cups at lunch. Every so often I reminisce with a few close friends, who I met in the hospital, about out “those days.” Many of us are in remission or have found ways to cope with our illnesses outside of frequent appointments and emergencies. Others are still struggling, but have an amazing network of family, friends, and doctors who are there to support them every moment of their journey. When I was talking with my friends, I realized we all had fond memories of our nurses knowing our favorite shows, what we were studying in school, or which activities we were excited to go back to! We all had jokes about which arms or veins were best for blood draws and IV’s. 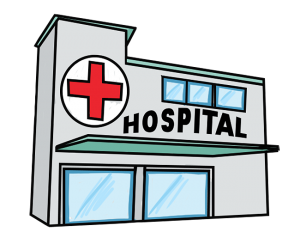 We were all confident we could navigate the hospital so well, perhaps better than our own towns, that we could give directions to other people even to this day; most importantly we knew approximately five ways to get to the cafeteria! 1. Your biggest allies are the nurses. 2. You almost always anticipate that your plans will fall through because of an unexpected trip to the ER (or an appointment you forgot about). 3. Random things like the smell of Purell, concrete staircases, or writing your order with a golf pencil at restaurants remind you of the hospital. 4. Your best friends are people you met in the hospital, and over a decade later you still keep in touch. 5. You laugh whenever someone asks you to rate your pain on a scale of one to 10. 6. You’ve perfected realizing when someone isn’t really “fine” because you too perfected looking “fine” when you’re not. 7. Even though it’s a bit twisted, you get excited if you learn someone has the same condition as you. 9. You watch “Grey’s Anatomy” and scream at the TV because that would never happen in real life! 11. You can explain the spoon theory with more accuracy and detail than your actual homework! If you ask most hospital kids, they’ll say their upbringing inside the walls of the hospital was definitely not traditional! They’ll probably tell you that they’d never wish chronic illness on anyone, but in hindsight they can’t imagine their lives without their stories of medical struggles and victories. Our illnesses don’t have to define us, but the definitely shape who we are and how we encounter the world.